Brahms - Liste des oeuvres. Les meilleurs airs classiques. Brahms Revenir à la liste des compositeurs. 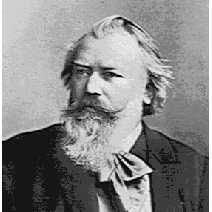 Johannes Brahms followed the classical tradition in form, but his music exhibits a strong lyrical romanticism. Brahms was born in Hamburg, and the discipline and orderliness in his approach to music might be attributed to his North-German origins. He began his career as a caf� pianist, and he was later encouraged by Liszt and Schumann. At the age of 29 he moved south and settled in Vienna. He was middle-aged before he wrote his 1st Symphony. He wrote 4 symphonies, 2 piano concertos, a Violin Concerto, a double concerto for violin and cello, and a great deal of beautiful chamber music. Oeuvres musicales écrites par Brahms Audio est disponible pour 46 mélodies par ce compositeur.